It's been a while since we've heard from you. Are you still answering questions? What's your take on new puppy Lucy? How has her presence changed your life? How has it changed Jeff the Cat's? 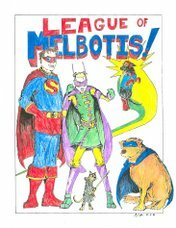 Melbotis agree that it been long time since Mel say much. Ever since Mel get e-mail, Mel have many, many e-mails. Mel keep getting e-mail from many bank asking for information for verification and Mel keep having to send and send and send. Won't bank keep Mel information written down on sticky paper? Also, Mel send off for pills to make Mel a "man." Mel looking forward to being man and yelling at other dogs. "Sit down, doggy! Go outside, doggy!" Mel will play trick when Mel is man and Mel will go into garbage can all he want and nobody stop him. This is what Mel think he look like when he is man. Mel will answer many questions when Mel get them, but sometime Mel get question and he forget despite Mel having best of intentions. Thank you, Jamie for reminding Mel every ten minutes of e-mail. You ask about little black dog who show up. Little black dog kind of scare Mel, then Mel remember he is huge and show little black dog who boss is. So Mel pretend to eat little black dog, and when that not work, Mel actually try to eat little black dog. Little black dog is much better now. Anyway, little black dog say to me, "Hey, doggy! Hey, doggy! Hey, doggy!" And Mel say, "You say 'Hey, doggy!'" And little black doggy say, "What?" And then little black doggy go off and chew on a rock. Sometime she chew on Mel's ear, and Mel have to pin Lucy, but all in all, Mel like little black doggy and hope he not have to eat her. Before answering mail, Mel went to cat and said, "hey, Cat! What about little black dog?" And Jeff say, "-the temperature at 5:00 shall be 72 degrees with winds out of the southwest." And Mel say, "No, little black doggy." And Jeff say, "Your classic rock station with all the hits! Rockin' 98.5 FM!!!!" So Mel not sure. But sometime Jeff throw up now after little black doggy tries to say "Hello." Mel hope all Leaguers having good day. Mel happy to be back at glowy pizza box thing.